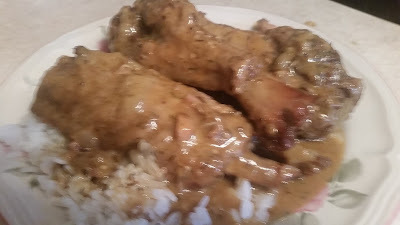 Maya Angelou’s smothered chicken is delicious and quite easy to cook. It tastes yummy and creamy yet it’s sinless because the ingredients used are healthy stuffs. Oprah calls this suffocated chicken! Wash and pat dry the chicken. Cut each chicken into pieces and place the pieces in a bowl with lemon juice and water to cover. Refrigerate for 1 hour. Wash the lemon water off the chicken and season it with salt and pepper. Dredge the chicken pieces in 3/4 cup of the flour. In a large skillet, heat the butter and 1/4 cup of the vegetable oil over high heat. Add the chicken pieces and fry until dark brown. Remove them from the skillet. Add the remaining 1/4 cup flour and 1/4 cup vegetable oil to the skillet. Cook the flour until it’s brown. Add the onions, mushrooms and garlic, stirring constantly. Put the chicken back into the skillet. Add the chicken broth and water to cover. Turn the heat to medium and cook for 25 minutes or until the chicken is cooked through.